Hamilton is within both the Hamilton, Larkhall and Stonehouse and the Uddingston and Bellshill Scottish parliamentary constituencies. It is also within the Central Scotland Regional List area. Biography:Christina McKelvie worked as a learning and development officer with Glasgow City Council Social Work Services before being elected as an MSP for the most recent Scottish Parliament. She was a member of the Scottish Parliament Education, Lifelong Learning and Culture Committee and of cross-party groups on learning disability, asylum seekers and refugees, children and young people and nuclear disarmament. Ms McKelvie is an active member of Unison. Biography:Michael McMahon worked as a welder before going to University in 1992, where he was awarded a degree in Social Sciences, Politics and Sociology. He pursued a career in social and political research, before being elected to the Scottish Parliament in 1999. Mr McMahon was Chair of the GMB and the STUC Youth Committees. He is married with three children. The Hamilton, Larkhall and Stonehouse constituency contains the following council wards: Ward 5 - Avondale and Stonehouse (part); Ward 17 - Hamilton North and East (part); Ward 18 - Hamilton West and Earnock; Ward 19 - Hamilton South; and Ward 20 - Larkhall. The Uddingston and Bellshill constituency consists of the following council wards within the North Lanarkshire Council Area: Ward 13 – Thorniewood; Ward 14 – Bellshill; Ward 17 – Motherwell North (part). In the South Lanarkshire Council Area it contains Ward 15 – Blantyre (part); Ward 16 – Bothwell and Uddingston; and Ward 17 – Hamilton North and East (part). Biography: Clare Adamson was elected to Parliament in 2011. She is a member of the International Children's Games Organising Committee, a board member of North Lanarkshire Leisure Trust, and executive member of the Scottish Accident Prevention Council. Before her election, Ms Adamson worked for four years in the SNP headquarters as an IT Project Manager. Please use Parliamentary contact information. Biography: Mark Griffin graduated from the University of Strathclyde with a degree in Mechanical Engineering in 2007. Mr Griffin worked in the engineering industry before being elected to serve as a North Lanarkshire Councillor for Kilsyth in 2008. He was elected to the Parliament in 2011. Biography:Richard Lyle was born in Bothwellhaugh, Lanarkshire in 1950. He was educated at Lawmuir School and Bellshill Academy. Mr Lyle served as a Councillor for Motherwell district since winning a by-election there in 1976. He has also been SNP group leader in Motherwell and North Lanarkshire. He was elected as a Central Scotland member for Parliament in 2011. Biography:Margaret McCulloch was born in Glasgow and moved to East Kilbride over 35 years ago. She graduated from Glasgow Caledonian University with a post-graduate certificate in Electronic Business. She worked at the University of Strathclyde for over 17 years, and prior to her election to Parliament in 2011, worked training Modern Apprentices in a wide range of occupational areas. Biography:Born in Bellshill, Siobhan McMahon graduated from Glasgow Caledonian University with a degree in Politics with History and Sociology. 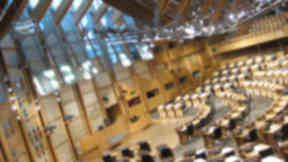 Prior to her election in 2011, Ms McMahon worked for the Labour Group at the Scottish Parliament, the Whip’s Office and as a Research Assistant to Rt. Hon Jim Murphy MP and Ken Macintosh MSP. She is a member of the GMB and currently serves on the STUC Disabled Workers Committee. Biography: Margaret Mitchell was born and raised in Coatbridge. She taught in primary and special education schools in Lanarkshire before studying Law at Strathclyde University. Ms Mitchell is a former Justice of the Peace and Non Executive Director of Hairmyres and Stonehouse NHS Trust. She was elected as MSP for the Central Scotland parliamentary region in 2007. She enjoys sailing, cycling, photography and golf. Biography:Born and raised in Falkirk, John Wilson moved to Coatbridge in 1982. He was elected as a South of Scotland MSP in 2007, and to the Central Scotland list in 2011. Before becoming an MSP, Mr Wilson was a coachbuilder. He graduated in Politics and Economic History at Glasgow University after being made redundant, then entered the voluntary sector. Until his election, he was the Director of the Scottish Low Pay Unit. You can find information about constituency and regional boundaries at the Boundary Commission Scotland website.